Unanimously regarded by scholars as one of the masterpieces of Angelico's late career, this impressive, exceptionally well preserved panel was originally the center of a tabernacle triptych, possibly intended for private devotion. The composition is centered around the monumental figure of the crucified Christ, with the arms of the cross extending the full width of the panel and articulating the division of the picture field into a lower, rectangular zone and a triangular gable above it. Occupying the full space of the painted gable is the motif of the pelican pricking her own breast to feed her young with her blood — a symbol of Christ's sacrifice for humanity. Flanking the cross are the mourning figures of the Virgin and Saint John the Evangelist, and kneeling in adoration below it is the painting's donor, identified as a Dominican cardinal by his dress and the red hat placed prominently next to him. While also recognizing this work as one of the missing lateral panels flanking the Crucifixion, Miklos Boskovits suggested more persuasively that this figure was the martyred pope Saint Sixtus II — an obvious reference to Cardinal Torquemada's titular church in Rome. 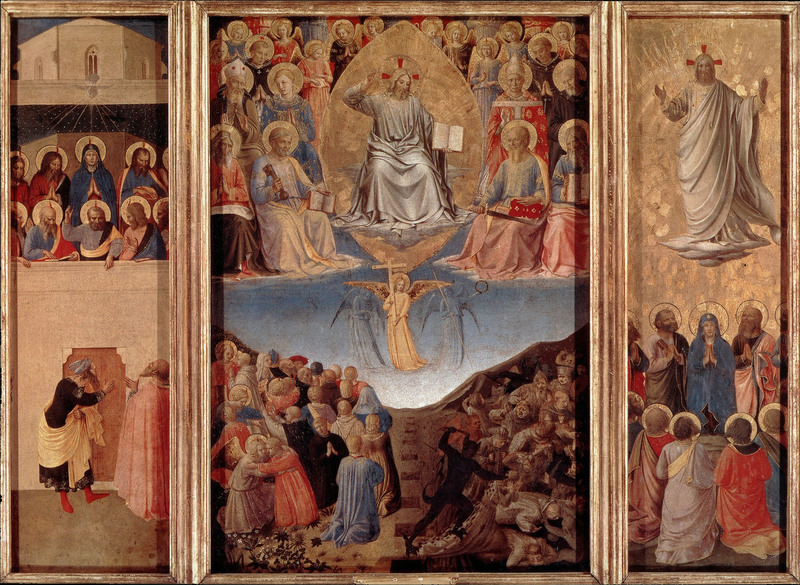 (*4) Based on the perception that the saint had been portrayed with the features of Pope Eugenius IV, Boskovits went on to place the painting's execution in the period of the latter's pontificate — specifically, between the end of 1445, when Angelico probably left Florence for Rome, and February 1447, the date of the pope's death. Efforts to circumscribe these works within the pontificate of Eugenius IV simply on the basis of the presumed likeness of certain figures to the pope appear forced, however, in light of stylistic considerations and the often-noted similarity of the paintings to Angelico's later production. 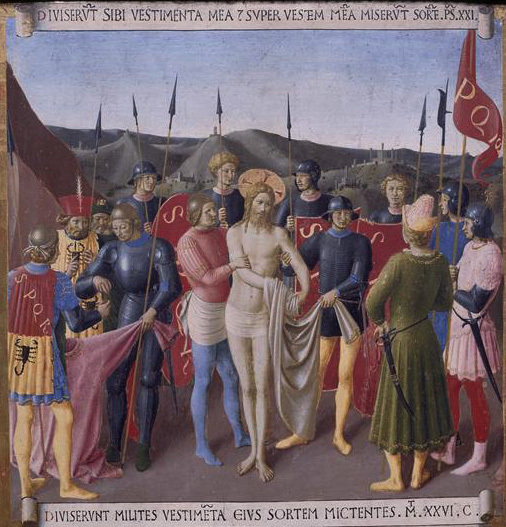 Pope-Hennessy,(*8) followed by Argant and more recently by Mauro Minardi,(*9) aptly emphasized the close relationship between the Crucifixion and Angelico's last docu-mented work, the panels for the silver chest in Santissima Annunziata, Florence (fig. 132):(*10) datable on the basis of doc-umentary and circumstantial evidence between about 1450 and 1452, following the artist's return to Florence and before his second departure for Rome,(*11) these scenes provide a firm point of reference for the painting. Common to both, and unique among Angelico's works, is the particular type of Christ — an impossibly slender, pallid figure bathed in a luminous, alabaster glow. It is also in the silver chest panels that one finds the nearest equivalent for the elongated, powerfully statuesque images of the Virgin and the Evangelist, whose sharply delineated, pointed features and gestures express a new depth of emotional intensity not found in the artist's previous production. In no other painting by Angelico is the reality of human suffering more evident than in the face of the Virgin in the Fogg panel, aged by grief into that of an old woman with wrinkles and sunken cheeks; her deeply furrowed brow and downturned mouth, with its clenched lips, belying a dignified effort to restrain an insurmountable grief. Like the silver chest, the Crucifixion may be said to mark the final evolution of Angelico's vision toward a monumental religious art imbued with both the nobility and pathos of human existence. Accepting Pope-Hennessy's late dating of the Fogg picture, William Hood made the interesting suggestion that the Crucifixion, an appropriate image for a Dominican cell, may have been executed while both Angelico and Torquemada were in residence in the Dominican monastery of Santa Maria sopra Minerva in Rome in the early 1450s. (*12) This important institution was the official headquarters of the order in the city, and it was here that Angelico died and was laid to rest in 1455. According to Vasari, the artist had painted a high altarpiece and an Annunciation for the same church, both of which are either lost or unidentified (see cat. 37). In a recent study, Gerardo de Simone has highlighted Juan de Torquemada's extensive participation in the program of rebuilding and reform of the monastery, beginning in the early 1450s, and Angelico's possible role in the design of a (now lost) fresco cycle in the new cloister based on the text of the Meditationes composed by the cardinal. (*13) One of the scenes in the fresco cycle, reconstructed on the basis of an illustrated manuscript copy of the Meditationes in the Vatican Library (Ms.Vat. Lat. 973), contained a portrait of the cardinal kneeling at the feet of Saint Sixtus, which De Simone placed in direct relationship to the portrait in the Fogg Crucifixion — albeit acknowledging it to have been executed as much as fifteen years later. (*14) This lost fresco, it has been argued, served as a model for a third portrait of Torquemada, in which he is shown kneeling in profile beside his cardinal's hat, in an Annunciation painted by Antoniazzo Romano for the chapel erected by the cardinal in the same monastery in 1464. (*15) It is possible, on the other hand, that the model for both the fresco and the Annunciation portrait, in fact, may have been the likeness painted by Angelico in the Fogg triptych, perhaps installed in the cardinal's quarters in Santa Maria sopra Minerva. (*1). Valois 1904, pp. 461-70. (*2). For a summary of the literature on Torquemada, see De Simone 2002, pp. 41-87. (*3). The panel was sold at auction at Sotheby's, London, December 6, 1972 (lot 7); Pope-Hennessy 1974, pp. 37, 218. (*4). Boskovits 1976b, pp. 43, 45, 53 notes 28, 32. According to Boskovits, this identification would appear to be confirmed by the fragmentary text at the base of the painting: SC ... STVS. (*5). Bowron 1990, p. 97; Spike 1996, p. 95; Bonsanti 1998, p. 146; Strehlke 1998, pp. 51, 119; De Simone 2002, pp. 57-59. (*6). Strehlke 1998, pp. 51, 119. (*7). Pope-Hennessy 1952, pp. 30, 196; Pope-Hennessy 1974, pp. 37, 219. (*9). M. Minardi, in Toscano and Capitelli 2002, p. 179. (*10). It is worth noting that, while accepting Boskovits's dating for the Christ on the Cross, G. Bonsanti (1998, p. 146) also pointed out that the suggested portrait of Eugenius IV could be a posthumous reference, presumably implying that the image might, in fact, have been executed after 1447. (*11). Bonsanti 2003, pp. 162-64 (with earlier bibliography). (*12). Hood 1993, p. 197. (*13). G. De Simone 2002. (*14). De Simone (2002, p. 83 n. 116) accepts Boskovits's dating of the Fogg picture before 1447, and he dates the Vatican manuscript to the early 1460s. (*15). This portrait was used by Valois (1904) and later authors as the basis for the identification ofTorquemada in the Fogg Crucifixion. (*16). Wilkins 2002, p. 388 n. 19. The author cites the example of the Sienese painter Paolo di Giovanni Fei, whose triptych of the Trinity and the Crucifixion in Naples Cathedral was described by eighteenth-century sources as "a little portable altarpiece that folded up, the inseparable companion of Cardinal Enrico Minutolo, who used to celebrate the holy sacrifice of the Mass in front of it wherever he carried it." (*17). For a discussion of this hymn, written by Aquinas in praise of the Eucharist and as a statement of faith in its redeeming quality, see Wielockx 1998, pp. 157-74 (with earlier bibliography). The hymn is included in the Roman missal and breviary.